2016 Newly Constructed Cabin Minutes From Downtown Gatlinburg! A stunning BRAND NEW 2 bedroom 2 bath chalet with upgraded amenities for your enjoyment in Gatlinburg city limits with easy access to all attractions! Attractive and appealing wood finishes throughout. Enjoy outdoor dining on wrap around deck and spacious backyard for family fun around fire pit! The cabin is maintained by Mountaineer Cleaning Company to provide you with a neat, clean, and elegant cabin. In addition, as owners, we live in the area and inspect the cabin on a weekly basis. Cabin has a fire sprinkler system for your protection. 2 bedroom, 2 bath log cabin in Gatlinburg city limits. Leather commercial grade sofa sleeper sleeps 2. Brand new construction (2016). Location is superb! No steep roads, private/wooded setting and you're walking distance to Hwy 321 and trolly stop. Wooded/forest setting beautifully landscape. Features include an all wood interior, hardwood floors, cathedral ceilings with exposed beams, floor to ceiling windows and new kitchen appliances with granite counter top. There is a king bed in the loft with a private bath. Queen bed on main level with private bath. New mattress on queen bed 3/2019. Beautiful large kitchen fully equipped for cooking. BBQ area off of front of cabin and fire pit in private backyard among the beautiful trees and forest. WiFi provided. The large deck has a private hot tub and outdoor dining area. The wooded/private backyard consist of a fire pit with outdoor seating. Perfect for those cool evenings! The living area is on the main floor with fireplace, kitchen and queen bedroom with private bath. The king bedroom is in the loft area with a sitting area and private bath. YOU ARE ONLY GIVEN A SMALL STARTER SUPPLY OF TOILET PAPER, SOAP, PAPER TOWELS, TRASH BAGS, ETC. YOU MAY BRING SOME WITH YOU OR SHOP AT FOOD CITY GROCERY WHICH IS ONLY 1 MILE AWAY. WE DO NOT SUPPLY PANTRY ITEMS FOR YOUR SAFETY AND HEALTH. THANK YOU FOR YOUR COOPERATION AND UNDERSTANDING. 3 DAY MINIMUM STAY. 2 DAYS MAY BE CONSIDERED. PLEASE EMAIL OWNER FOR CONFIRMATION BEFORE BOOKING A 2 DAY RENTAL. Monthly rentals available. Call/email for discounted rate. After moving in the area of 2016, we purchased one 3 bedroom cabin and loved the idea of renting it and maintaining it that we started looking for another cabin to buy and rent. Most cabins were old and run down and needed to be updated, including the grounds. Our search lasted 6 months of driving the areas and looking for the cabin that was just "perfect." We came across this cabin as soon as it was finished being built and immediately knew that this was the one. We loved the long driveway going to the cabin, the new construction and the great location! After purchasing the cabin added some personal touches to make the cabin welcoming to all guests. First, it is BRAND NEW! The second is LOCATION, and the third is PRIVATE/SECLUDED WOODED/FOREST acre lot. Dollywood, Splash Country, Dixie Stampede, Ripley's Aquarium, and Ober Gatlinburg are all within a short distance. Approximate Distance: Gatlinburg: 2 miles, Downtown Pigeon Forge 5 miles, Dollywood 5 miles, and Great Smoky National Park 3 miles. Amenities include: location, new construction, hot tub, fire pit, deck, washer and dryer, outdoor BBQ, wifi, air conditioning, 2 bedrooms with private bath . 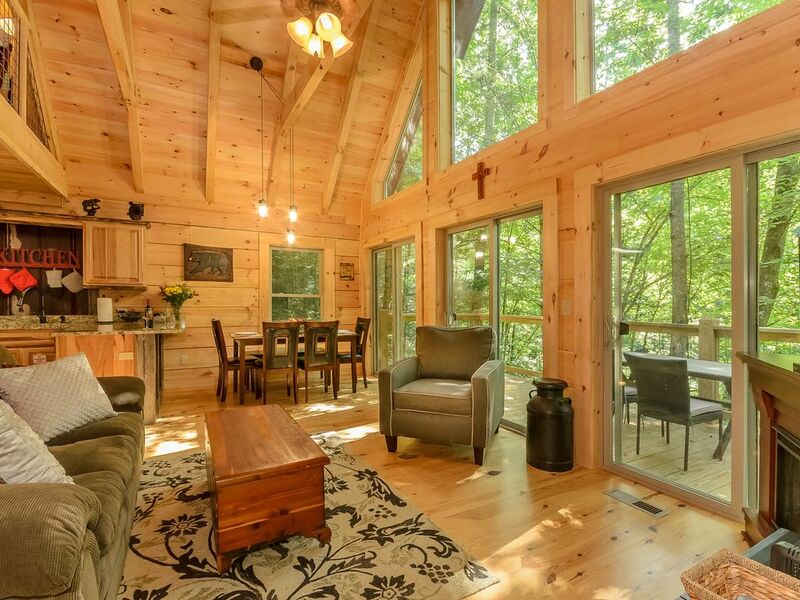 Floor to ceiling cathedral windows in living area and lots of windows throughout the cabin to view the natural beauty the Great Smoky Mountains. Commercial grade leather sleeper sofa sleeps 2 comfortable. toilet, combination tub/shower, On loft area adjacent to king bedroom. toilet, combination tub/shower, On main level adjacent to queen bedroom. Only 2 mile from downtown Gatlinburg, yet in a semi secluded forest/wooded area. Private setting. Combination washer and dryer. Iron and ironing board provided. Large floor to ceiling windows for viewing the wildlife and wooded areas. Commercial grade leather sofa sleeper sleeps 2 comfortably. Deck with hot tub and table and chairs for eating outdoors. Backyard patio and fire pit with outdoor seating. Ober Ski Mountain only minutes away. Property is not suited for handicapped or those with disabilities. Outdoor hot tub on deck in private setting. The hot tub is emptied after the departure of each guest for your safety and sanitation. Please allow 24 hours for the hot tub to heat. Enjoy all the benefits of a brand new cabin with new appliances, granite countertop, and all new furniture. Tastefully decorated and is suitable for families, couples, or a single person. Cabin is very well maintained and is in a private area off of the main strip of Gatlinburg. Lots of windows for a bright and enjoyable stay. Commercial grade leather sofa sleeper sleeps 2 comfortably. Our family really enjoyed this cabin for our spring break. The location was perfect and close to town, activities, restaurants, and grocery store. Very clean and very well maintained by owners. Nicely decorated and comfortable living area, kitchen, baths, and bedrooms. Everyone had great night sleep and ready for the next day of activities. We used the kitchen a lot and cooked many meals at home. Kitchen is well stocked and large for a cabin this size. Plan on coming back in fall and will be renting this cabin again. Once you find something you are happy with there is no need to look further. Great price also!! Thank you for being such a great host having cabin well maintained for your guests. We had a great time here. The cabin is very convenient to town. We would definitely come back. Thank you Christina for taking the time to write a review and rate the property. It was a pleasure to have you as a guest. Glad the cabin met your expectations and you enjoyed the close location to town. It is appreciated that you chose the Woodlands for your vacation. Fantastic! Our teenagers had loads of fun exploring Gatlinburg during the day, having a fire in the evening and soaking in the hot tub! The owners were available for questions and went out of their way to make our vacation perfect. This cabin was the perfect getaway! Thank you Adrienne for your reservation and reviewing the property. I appreciate you choosing Woodlands of the Smokies for your vacation. You were a great guest and hope you enjoyed all your adventures in Gatlinburg. Second year to stay here, Will be back! We have stayed here the last two years for spring break and absolutely love this sweet, homey cabin! So close to downtown and easy to get to anything! Always feels so cozy when we stay with our 3 children. Already looking forward to our next visit! You and your family are such a great guest and I enjoy renting to you. I happened to go by the cabin later in the afternoon to do a few things before housekeeping got there and I must extend my thanks for taking such great care of the cabin. You and your family are very neat and take care of the property extremely well. It is very much appreciated. If you get ready to rent again next year, remind me in advance so I can give you a discount on your repeat business. Thank you so much again and happy that your family made some fond memories together. We enjoyed our stay but only wished the washer dryer combo could do laundry faster. It took over 6 hours to dry a small load which seemed like a long time when one is busy sightseeing and hiking. The cabin is in a great location near the national park, grocery store, and Gatlinburg. Very nice setting too. Thank you Mary Kay for your reservation and stay at Woodlands of the Smokies. I appreciate your review and feedback. Hope you enjoyed your stay and the Smoky Mtn. National Park. I was a pleasure to have you as a guest. 2 bedroom, 2 bath log cabin in Gatlinburg city limits. Brand new construction (2016). Location is superb! No steep roads, private/wooded setting and you are also walking distance to Hwy 321 and trolly stop. Great for the many activities in Gatlinburg. Located near restaurants, art galleries, shopping and only 5 minutes from Food City Grocery. The entrance to the Great Smoky National Park takes 5-10 minutes. In addition, Pigeon Forge, Sevierville, and Dollywood are only minutes away. Driving directions and lock code will be given a few days before your arrival or after your final payment. Cabin does have free wifi.